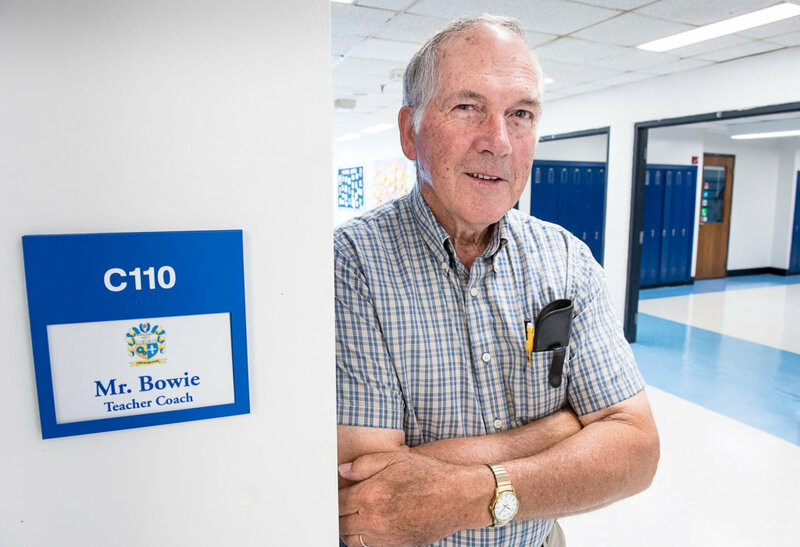 LEWISTON — With classes back in session, this year marks the 51st first day of school for Lewiston High’s David Bowie. 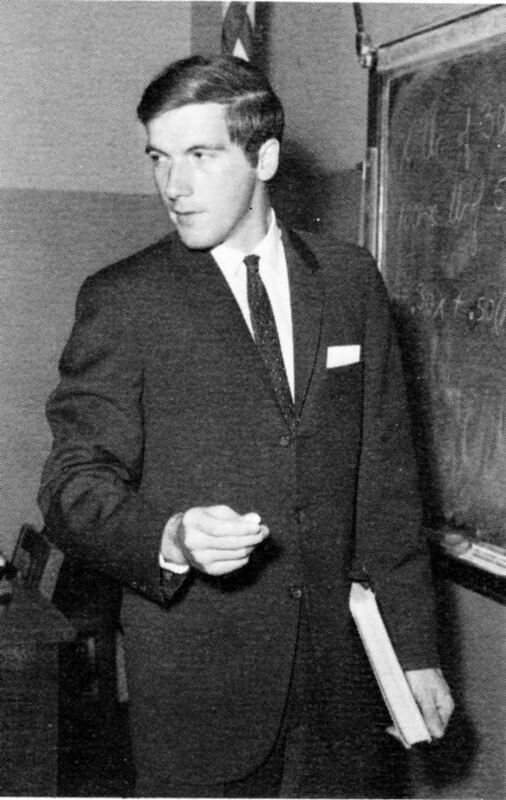 Bowie was 21 when he was hired in 1968 as a math teacher. 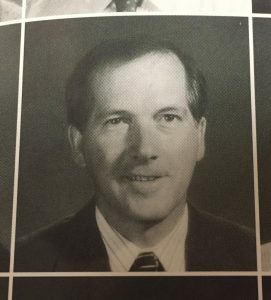 He has been at Lewiston High School ever since. Most people do not stay at one place for 50 years, or continue working until his age of 71, especially those who have a pension. Bowie said he has stayed because the work and school makes him happy. He likes to be challenged. Principal Jake Langlais said Bowie’s long career is remarkable and rare. “The only place I hear about a 50th year celebration is a wedding anniversary,” Langlais said. 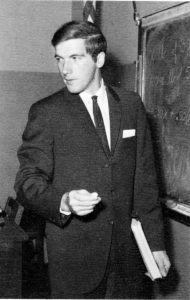 In fact, Langlais was not alive when Bowie started at the high school. “I wasn’t even thought of yet,” Langlais said with a laugh, adding he has just turned 40. Bowie’s current job is teacher coach. 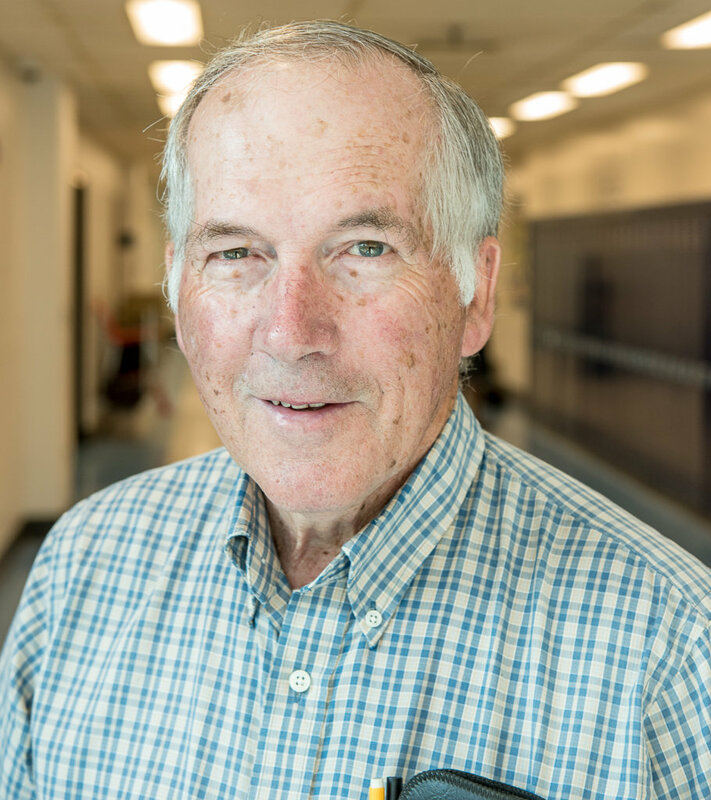 As one of the school’s first to teach computer labs to students, Bowie does data work for the school and district, he coaches teachers and does some teaching himself. Bowie grew up in Lisbon on his parents’ dairy farm. He graduated from Lisbon High School, then Bates College. In 1968-69, Lewiston High was in the building that is now Lewiston Middle School. Lewiston was a big school. As a new teacher, “it was intimidating in terms of size,” Bowie said. At 21, he was not much older than his students. That wasn’t a problem, he said. The high school on Central Avenue was crowded. When the new high school opened on East Avenue in 1973, “this place was heaven,” Bowie said. In the first year, students were treated to an open campus. They could come and go when they did not have class, like at a college campus. There were even tennis tables and pool tables for students in the basement. Soon, there were two computer labs. By the mid-1980s, there was a focus on standardized testing, including the Maine Education Assessment tests. One was that girls were routinely steered into business math courses, such as accounting and bookkeeping, “which were fine courses, but not what was being tested,” Bowie said. The data revealed there was not a gender difference in learning. It was a difference in exposure to courses. In the 1990s and early 2000s, the focus was on standards; specifically, what students should know no matter where they live. Every academic field now has a set of standards, Bowie said. There soon came a large wave of minorities. As Somali families moved to Lewiston, the percentage of minority students increased from 5 percent in 2006 to 20 percent in 2011. That is a short time for the student population to change so dramatically, he said. Today’s change and challenge at the high school is reporting standards-based learning, and whether to use a grading system of 1 to 4 or the traditional 0-100. He has seen all kinds of students. Bowie said he enjoys knowing he has helped students learn and develop skills. LEWISTON — People pause when they hear you share a name with British pop star David Bowie. Since David Bowie started teaching math at Lewiston High School in 1968, he has heard “quite a bit” of reaction to his name. He first learned about David Bowie the singer when teacher David Bowie was in his then-girlfriend’s kitchen in the late 1960s. “My wife and I had just started dating,” he said. His wife is Eileen Poulin. They met on the first day of school in 1968. She was an English teacher. “Her little sister comes in with a teen magazine about a guy from Britain named David Bowie,” he said. For years, including when attending math conferences in New Hampshire, people would see his name and ask about it. “Some students said, ‘Can I have your autograph? '” Bowie said. It is, but it was not the original name of the singer David Bowie, who was born David Robert Jones. Lewiston’s David Bowie and Britian’s David Bowie were born a few months apart — math teacher Bowie in November 1946, singer Bowie in January, 1947. 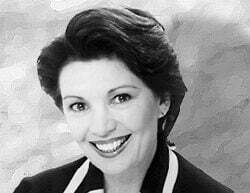 The singer died in 2016. Bowie’s was not the only recognizable name at Lewiston High School.